Scam: doesn’t it make you feel a little dirty reading it? Most people know scams exist, and I like to think I’m too wise to be scammed. But, truth be told, I have been the victim of a scam before. I first got scammed when I was 8 years old on a beach in Tampa, Florida. I had befriended a 12 year old boy named John. John and I were having a great day playing in the waves and sand when I found a gold necklace on the beach! John was excited because he said he knew who the owner was and that they would be happy to get it back! I’d always loved helping people and doing the right thing, so when John assured me he would give the necklace back to the owners, I believed him. John said he would be right back, he ran off, and, well, I never saw John again. Scams come in all shapes and sizes, from e-mail scams claiming you’re the next Prince of Saudi Arabia, to ones claiming a miracle pill will help you lose the last bit of weight. The internet has made scams more prevalent than ever before. And with the internet, scammers have a global audience. Unfortunately, these scams have even infiltrated the world of dog ownership, and “fake puppy” scams are becoming more and more common. In this article, I will take you with me as I actively seek out a Pomsky from known scammers. This will be the most detailed account of how they do it, how to combat it, and ultimately how to not become a victim. Whether this is the first time you’ve heard of breeder scams or the 1ooth, I can guarantee you will learn stuff here that no one has covered. 0.0.0.1 I’m buying a Pomsky! It’s just for research, I swear ;). Truth be told, I don’t have a Pomsky. I’m a dog lover with 2 dogs in a building that doesn’t allow anymore than that. But for the sake of this article, I’m going to pretend I’m a potential Pomsky buyer. I actively sought out the shadiest sellers, and known Pomsky scammers. To start the process of finding fraudulent Pomsky sites, I visited Pomsky Scam Alert on Facebook. It’s a site dedicated to outing scammers and bad breeders. On the site you can see a list of websites where people are trying to swindle you out of your hard earned cash. I visited all the sites on this list. Some don’t exist anymore, some redirected me to new domains, and some are still there. I took the angle that I was a man looking for a Pomsky for his daughter’s upcoming birthday. Barezpomskypups.com was one of the three I initially chose because the website worked and it appeared plausible that they bred Pomskies. I’ve never seen this format for listing a telephone number-“Tel# (337)800-5393”, which is the first “red flag” I make a note of. Their images look friendly friendly and not generic and it doesn’t look like they used a stock photo or a photo of a different breed of dog. I can see how this site could trick an inexperienced potential owner. Here is the best tool you will take away from this article and one that I incorporate when I first visit a site: When you are searching for something as unique as puppies for sale, the image should be very unique and, for the most part, shouldn’t appear anywhere else on the internet. You will first need to save the image from the website. Right click the image and hit “save image as”. The top image that text reads: “My Pomsky Puppies Get the Best” wouldn’t allow me to save it, so I used the image below the title “FAMILY POMSKY HOME”. Click the camera icon next to the search box on Google Image Search and click “Upload an Image”. Now, click “Browse” and find where you saved that image. If you don’t remember, I would try “downloads”. The search will automatically run. Below the first 2 hits (puppy broker sites)will be the pages that this EXACT image appears as you can see by the small image. Give the second hit down a click. Does it look familiar? Now with this tool in your arsenal, you would be able to sniff out a scam before you wasted five minutes of your time. But, most people don’t know about searching images on Google, so I’ll keep the case study going and I’ll mix in my other tips and tricks. Claiming that they created the PCA (Pomsky Club of America) is the first major red flag, because this claim is easily verifiable. I headed over to PCA’s website and clicked on approved breeders. Barez Pomskies aren’t even approved on their “own” club’s website! I’m sure they hoped if they dropped Pomsky specific key words that no one would do any research. In the second sentence of the Mission Statement, they attempt to deceive the reader into thinking they are not scammers. I Googled “Rose Peek Pomskies”, and confirmed that they are a breeder. I couldn’t find these exact testimonials, but it is evident that Barez Pomskies just copied and pasted some older Rose Peek testimonials. Thereafter, they get down to business really quick. Payment and Shipping should NOT be the focal point of a breeder. If it is, they aren’t doing what is in the best interest of their puppies. Specifically, they mention a $300 deposit and shipping charges and do not reference the cost of a puppy. This is a major red flag. Lisa’s little paw is so close to showing us what year this picture is from! I don’t think it’s going to be 2016 or 2017. From here it was the waiting game, good news is I didn’t have to wait long, before the following email rolled in. 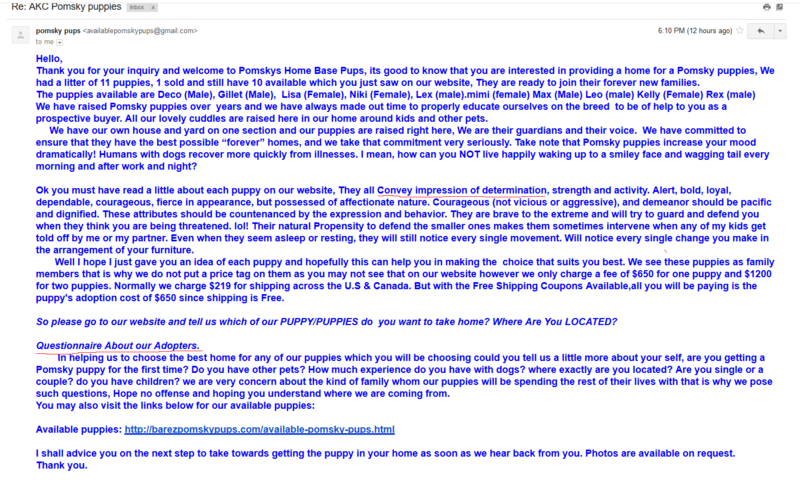 First, they mention the “impression” that the puppies have. I’ve never heard a breeder use that term to describe a group of puppies. I will see breeders describe a particular trait or two about an individual Pomsky, but not a group. Other than that, they seem to care about the well being of the Pomskies. Free shipping is a big red flag, especially at the bargain price of $650, because the average price of a Pomsky from the 31 owners we talked to was $2617. Other than price, it seems like they could be a real breeder or they have done a lot of homework. Second, the section entitled “Questionnaire About our Adopters” is something that all breeders and now apparently scammers will do, and it definitely adds credibility. Here is my response: I wanted to leave the door open for him to educate me on the Pomsky breed. He had a few extra pictures of Lisa in his back pocket and attached those. Thereafter, he was ready for my info and I decided to give him a twist and see how he handled it. Besides, I think this is a completely normal response for someone who doesn’t want to ship their Pomsky puppy. I honestly wasn’t sure what he would say. I figured it was make or break at this point and that there might be easier fish to fry. Now, it seems much more likely our breeder is in the green, or beige parts of the map. He’s suddenly ready for the deposit and it’s been 16 hours since I first inquired on his website at this point. He’s asking for $50 more than his website claims. I was shocked that he even gave me a phone number. So, I did what any person looking for a Pomsky should do; I called him from a Google Voice number I set up. Google Voice allows you to make a new number that will automatically forward calls to your cell phone so that you don’t give out your real number. Something I’ve learned is that if you’re calling from a Google Voice number and the other person has a Google Voice number, the person receiving the call is notified that they are receiving a Google Voice call. Now, this doesn’t mean anything bad, in and of itself, but it may mean that the person could be trying to conceal their real number or they are located overseas. I got on the phone with him and it was the lowest quality phone call I’ve ever been on. It had the makings of an old cell phone network commercial- “Can you hear me now?” Besides the poor quality, I could barely understand his English through his thick accent. We didn’t talk too long because the call eventually got dropped. If I had to guess I would say his accent was somewhere from Africa. I brought up how excited my daughters were going to be when we got Lisa. I also wanted to see if he had any human feelings inside of him but they found none. He was not very sharp on details. I asked him specifics about the parents and how long he’d been breeding Pomskies, but between the poor call quality, his poor English and lack of knowledge, he was clueless. He assured me that he would follow-up with me via email regarding where to send the payment. Then he started texting my email. That was the last contact we had. I want to highlight his last attempt to shut down my skepticism. Some people are willing to say and do whatever they can to scam you. A general lack of knowledge and ability to talk about Pomskies on the phone. Keep your bearings and research, research, research. I hope I have provided valuable tactics you can use to be more proactive in identifying Pomsky scams. We would love to hear your feedback!